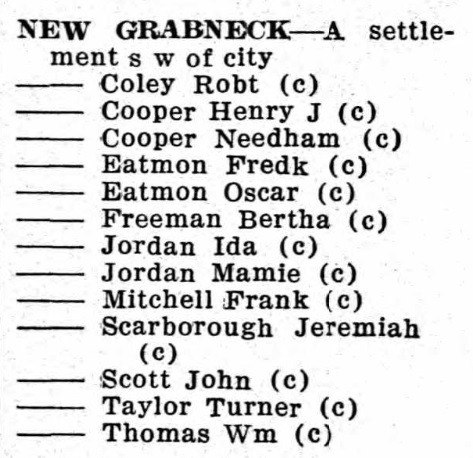 The 1930 edition of Hill’s Wilson, N.C., city directory reflects the full flower of segregated Wilson, with street after street east of the railroad occupied entirely by African-American households in patterns still easily recognized today. However, here and there clusters of houses appear at unfamiliar locations, either because the streets themselves have disappeared or because we have lost collective memory of these blocks as black neighborhoods. There is no Pecan Road in Wilson, though there is a Pecan Court off Kincaid Avenue in the approximate neighborhood of Pecan Road. Oil Mill Alley, oft-cited in Daily Times‘ crime beat columns, lay in the shadow of the fertilizer plant at the edge of the large cotton oil mill complex on Stemmery Street. It no longer exists. Parkers Alley, then known as Vicks Alley, is clearly shown in the 1922 Sanborn fire insurance map of Wilson as a small lane bordered by five small single-family dwellings and two duplexes. Young’s Alley is gone, likely lost to the urban renewal projects that reshaped Daniel Hill in the 1960s. On the 1922 Sanborn map of Wilson, it is labeled Townsend Alley. 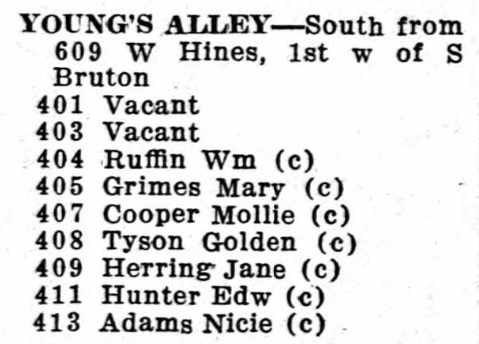 Today, West Spruce no longer intersects South Bruton, and the former Young’s Alley — designated as a red diagonal below — cuts through the middle of a large block bounded by South Bruton, West Hines, Warren and Walnut Streets. I was born, i am told, in New Grabneck. I know mothing about tje area though i would love to know more. I only know it was in the area of Daniel Hill and all births wrre at home with mid-wives.